Flowering rosette of the extremely rare Mauna Kea silversword (Argyroxiphium sandwicense subsp. sandwicense growing with a shrubby or tree-like member of the Hawaiian silversword alliance (Dubautia arborea) at about 2,950 m elevation. 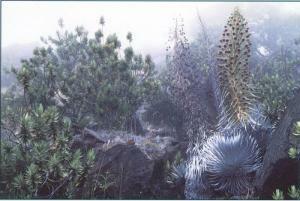 In spite of great morphological differences (including unbranched monocarpic rosette shrubs, highly branched polycarpic shrubs, trees, and vines), virtually all 28 species in the three genera constituting the silversword alliance retain the ability to hybridize, and many striking hybrid combinations are produced in nature.